Braamfontein Alive: Pikitup calls off strike: People in my community. 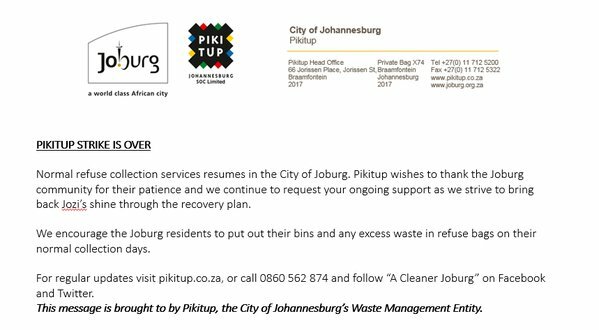 Pikitup calls off strike: People in my community. The days of commotion, dirty environment, incessant business districts disturbance seem to be over in Braamfontein as workers of Pikitup decided to bury the hatchet and go back to work while negotiations to put a lasting solution to the face up between the workers and the management of the company is still on. The workers are seeking a minimum wage of R8000 to R10000 and the laying off of a top officer of the company.